NAZARETH, PA (SEPTEMBER 6TH, 2011) Over the past weekend, Andretti Autosport’s Star Mazda championship driver – Sage Karam, made a huge step towards securing the Rookie of the Year award and also a run towards the championship standings. 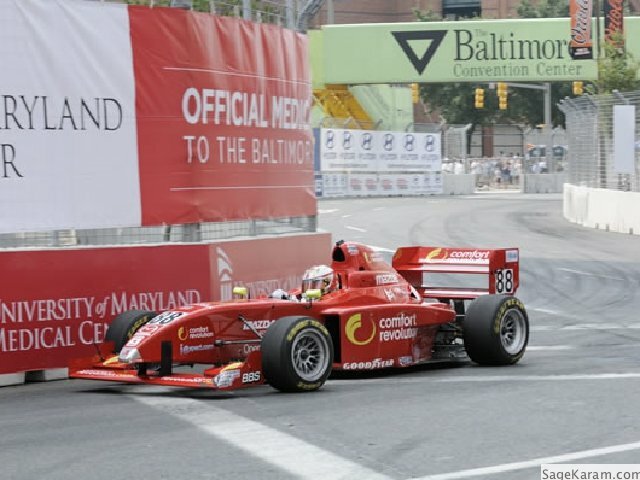 Karam posted a huge second place finish at the Baltimore Grand Prix. The podium finish boosted Karam’s resume to finishing an outstanding 7 out of 10 events in the top 5! “The series is just so competitive. It’s hard to believe that we have so many respectable finishes and are still only 5th in the standings.” Karam sits only 2 points out of 4th and 3 points out of 3rd. “It’s easy to point to the penalties at Mosport and Trois-Rivieras as reasons for not being in 2nd place, but I probably could have done a better job driving at St.Pete and Barber too. It was all part of the learning process”, said Karam. The Comfort Revolution/MazdaSpeed Scholarship driver heads into Monterrey’s Mazda Raceway with a load of confidence. “Obviously, we have improved a lot as a team and I have made a lot of progress as a driver. It is the first year for both me and the team in Star Mazda; I believe we were respectable at every venue. It’s my last race as a member of the MazdaSpeed driver family in Star Mazda. I want to give John Doonan (Director of Mazda Motorsports) a proud result at Mazda Raceway. Hopefully we will convene on other Mazda programs in the future. I believe that once you are in the Mazda family, you never really leave it”. Baltimore was a sweet ending to an up-and-down weekend for the 16-year old. Karam started Friday’s only practice in P1 by an amazing 1.1 second margin over the next fastest driver. Due to track repairs and setup, Saturday’s qualifying was replaced with another practice session. It was during this session that Sage found the limits of the #88 in turn four and tapped the wall. The accident caused Karam to sit out the session. “It was a surprise to damage the car. I only had damage on two other occasions (St.Pete race and Indy practice) and I am usually pretty good at taking care of my equipment. Repairing a car on race weekends really sets a team back. I know the team really appreciated my ability to keep the car out of trouble all year long”. Qualifying for Sunday’s race was relegated to the point’s standing and Sage was forced to start in the 5th position. With only 10 laps on the track, the top American teenager made quick work of advancing into the top three spots. Karam held this position until an opponent’s error moved Sage into the 2nd spot. The race finished under yellow and Sage crossed the finish line in 2nd place. “Yea, I was hoping for a restart. I knew Tristan couldn’t afford to tangle with me on a restart, because of his pending championship. But I also knew he wouldn’t just step aside and let me by neither. But, we ran out of time and the green never came. I think we proved a lot this year, but I still have some unsettled business”.